The All Bodo Students Union(ABSU) and its movement group like the NDFB-Progressive and PJACBM has called off its Five-day-old hunger strike this morning on the 6 days of the strike. The Bodo group which has been on an indefinite hunger strike since 10 March at the Kokrajhar Government Higher Secondary & Multipurpose School ground demanding a separate Bodoland state called off the fast at 9 am in the presence of hundreds of supporters and well-wishers. Kokrajhar deputy commissioner Bibekananda Choudhury and Superintendent of Police Rajen Singh and Bodoland University vice chancellor offered glass of water, cold drinks and sweets to the leaders. A letter from the Secretary to the govt of Assam, Home & Political department, Dispur M Hazarika was handed over to the movement group by Kokrajhar Deputy Commissioner Bibekananda Choudhury last evening with promise of initiating a tripartite talk at political level before 14 April 2017.. The letter stated that the state govt has been taking up with the Union government regarding the holding of the tripartite talks at political level with the govt of India, the govt of Assam, the ABSU and PJACBM. It also stated that a positive indication that the proposed tripartite talks at political level will take place before 14 April 2017. The Bodo groups are demanding early political solution to the long standing demand of separate Bodoland state and to protect, preserve and safeguard the identity of the indigenous people of Assam. 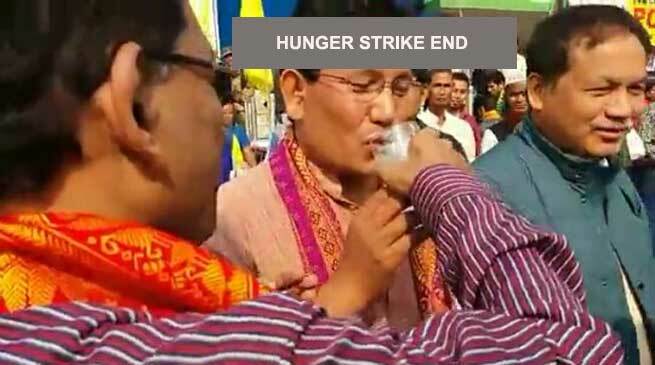 The ABSU president Pramod Boro said they have decided to call off the hunger strike respecting the movement promise of initiating talk before April 14 next. “We express our gratitude to the government for the letter but everything will depend on their sincerity. The government should not take the talks as a game,” he said. The ABSU leader also wants to the talk to be inclusive and conclusive involving all the movement groups including the NDFB. Stating that they would continue the movement, he said “We are determined and there would be no compromise on our demand. We will not tolerate any conspiracy,” Boro said. NDFB-Progressive president Dhiren Boro too wants the talks to be inclusive with representative from all the groups demanding Bodoland.